Politization of public administration, lack of independence, impartiality and objectivity of the judiciary and excessive pressure on civil society organizations are some of the main problems of democracy in Macedonia, it was concluded in the workshop “Democracy in Macedonia”, organized on 23 May 2017 under the auspices of the regional project “Democracy in progress: Shadow Progress Report on political Copenhagen criteria in Western Balkans EU candidate states”. The goal of the project, implemented by the Centre for Contemporary Politics and Cooperation and Development Institute with the support of the European Fund for the Balkans, is the publication of alternative, “shadow” country reports on the four EU candidate states in the Western Balkans – Macedonia, Montenegro, Serbia and Albania – which will be available in November 2017. On the workshop, a group of ten representatives of Macedonian NGOs, academics and individuals met in order to discuss the methodological and thematic challenges connected to the analysis of democracy in Macedonia. Following the tentative methodology drafted by the project team, the group sought answers to the questions “what” and “how” should be done in order to depict the state of democracy in Macedonia. Following the several clusters defined by the project team, the group began discussing elections and election-related issues. The group highlighted the following burning issues: political financing and financing of election campaigns, the “capture of the state” with emphasis on the politicization and partization of the public administration. One of the participants suggested considering the provisions of the American “Hedge Act” while proposing amendments to the Electoral Law. The voter register was also signaled out as a continuous problem. Furthermore, the participants noted the misuse of post-electoral nationalist discourse introducing the “Tirana Platform” as a burning issue. Other election-related issues which caught the eye of the discussants were: pre-electoral partisan employment, excessive pressure over high school students, the equality of the vote (distribution of voters throughout electoral units), as well as the needed reforms in order to further enhance the work of the State Election Commission (SEC). The group also highlighted the grave media problems calling for urgent media reforms. A suggestion was given for the implementation team to turn towards solutions crafted in the Paris Declaration for Media Literacy. Apart from the years-long drowning media freedoms, the participants highlighted the existence of pre and post electoral “life or death” discourse in the media, and the trend of renowned experts appearing in the media in order to forcefully defend the positions of the two larger political blocks, usually commenting policies, political decisions and similar occurrences ex ante, rather than ex post. The Assembly as “cradle of Macedonian democracy” was also put on the table. The participants signaled out the transformation of parliament into a voting machinery, lacking substantial debate. A central position in the shadow report should be given to the violent happenings of 27 April 2017, when armed right-wing mobsters stormed the parliamentary building in order to physically eliminate parliamentary majority MPs. On the other hand, experts singled out the numerous constitutional and legal shortcomings which preceded violence in parliament, but also to turn back towards the impunity of the 24 December 2012 events, the so called “Black Monday”. Lastly, the group turned towards the issue with the “European Laws” and the multiple issues of procedural breaches in the process of their enaction. 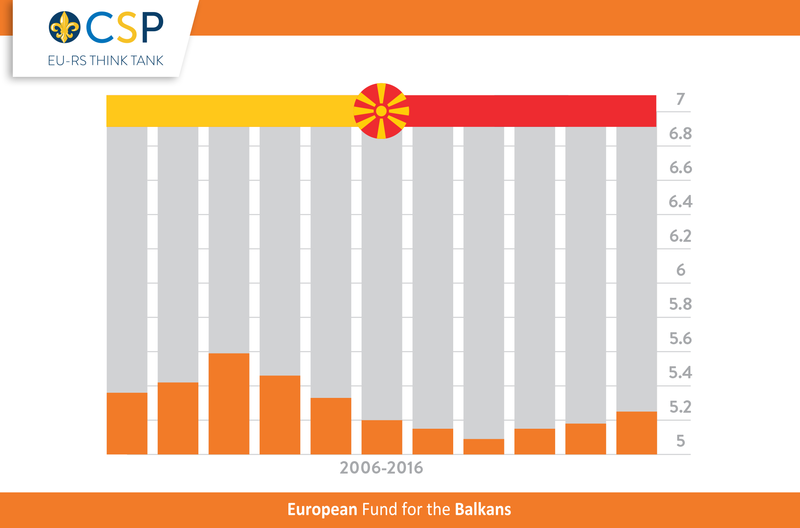 Numerous dissolutions of parliament during the last several years were also pointed out as contextual factors contributing to the ongoing political crisis in Macedonia. Judiciary was signaled out as one of the main problems in Macedonia. The lack of independence, impartiality and objectivity of the judiciary is connected both to mentality, but to a certain extent it also arises from the legislation, mainly from the Law on Courts and Law on Judicial Council. The latest scandal with the falsified TOEFL certificates of prospective public prosecutors was just the “icing of the cake” which was very telling for the current state of Macedonian judiciary. The last central point which was extensively discussed was the current state of civil society. The post-electoral period was marked by excessive pressure over anti-governmental NGOs in Macedonia. Apart from the continuous demonization by pro-VMRO-DPMNE media labeling these entities as traitors, foreign mercenaries and “SOROSoids”, many NGOs were subjected to numerous controls by the Tax Revenue Office and the Financial Police, physically being present in the organizations’ offices for months. Furthermore, the group initiated the politicization of the Council for cooperation with Civil Society in the sense of format, decision making and objectivity. This resulted with boycott by numerous renowned NGOs. Civil society was also tumbled by scandals at the National Agency for Mobility, as well as legal repression towards participants in the several waves of mobilization such as the “Colorful Revolution” and the “5 May Protests”. Other issues which should be taken into consideration and were pointed out by the participants are the high tolerance towards corruption and informal institutions, the reluctance to conduct census for more than 15 years, human rights violations mainly towards marginalized groups, prisoners and minorities. The meeting was circled with concrete reference proposals put forward by the workshop participants: outputs from the INFORM project and other reports produced by IDSCS; outputs from the MODEM project by the Institute for Communication; numerous reports produced by Eurothink think-tank referring to Europeanisation, democratization, and governance; reports produced by EPI referring to rule of law implementation in the WB; regular reports issued by the Macedonian Ombudsman. The project Democracy in Progress will continue with the publication of the four shadow country reports in autumn 2017.